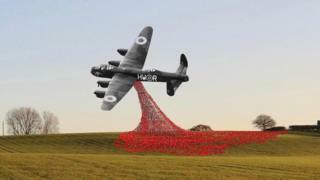 Enthusiasts behind plans to build a full size replica of a Lancaster bomber hope the sculpture can be in place by Armistice Day. The Bomber County Gateway Trust wants the structure - next to the A46 between Lincoln and Newark - to be a similar scale to The Angel of The North. The area is known as "bomber county" because of the number of military airfields it had during World War Two. The plans are being considered by North Kesteven District Council. A fundraising campaign is under way as the group need to raise £100,000 to pay for the sculpture. The trust wants to build a replica of a Lancaster on top of a 32ft (10m) structure, to give the impression of it flying as motorists enter Lincolnshire. It said the 85ft (26m) steel structure would include a support, which could be temporarily clad with poppies each November. Ken Sadler, from the trust, said they had had productive meetings with the council and were optimistic plans would be approved. "They were very keen to include the project in their tourism proposals so with that in mind we're very hopeful we will get the planning permission so we can make a start," he said. If approved, the trust want the statue to be built for Armistice Day on 11 November.